Welcome to the official FAQ page about the Classic Camera Revival Podcast! We are a group of four crazy photographers from the Greater Toronto Area who love to shoot film and talk about the cameras that we use on a regular basis often giving a personal review of the gear in hopes that if you, the listeners are interested in getting such a camera that it will give you a better understanding on what to expect and maybe a little insight to help you out in your journey! We currently produce a podcast that is released on the last Friday of every month, with a few bonus episodes sprinkled throughout the year! You can find our podcasts online on Podbean you can also subscribe via Apple Podcasts. And you can find us on Facebook & Twitter. Got a suggestion you can let us know through Social Media or Email: classiccamerarevival[at]gmail[dot]com. Alex Luyckx has been shooting like a madman for a good ten years now, but his interest in cameras as a technology goes much further back but it would be a media english class in highschool that got him seriously thinking about photography. A chance find of a Minolta Hi-Matic 7s at a garage sale and he was off. The Hi-Matic quickly turned into a Minolta SR-T 102 and then an X-7a. A Minolta DiMAGE Z2 saw his photography change with the digital age. While some people may knock it, Alex embraces it, as it got him the technical know-how about photography from composition to exposure. It would be the arrival of a Nikon F80 and running across the Film Photography Podcast that would see a return to film in a big way. Soon he would be back developing his own black & white film as well as colour, printing in a darkroom. While the Nikon F80 is a thing of the past, he still runs primaraly with Nikon using the professional F2 and F5 backed up by an FA, FE, and F90. For Minolta, yep he still shoots with an XE-7, XG-M, and Maxxum 9. 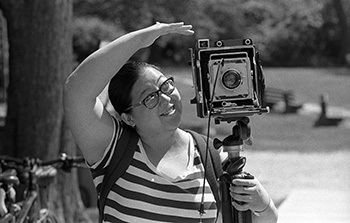 Rounded out the larger formats is a Rolleiflex, Hasselblad, Mamiya m645, and a Crown Graphic. 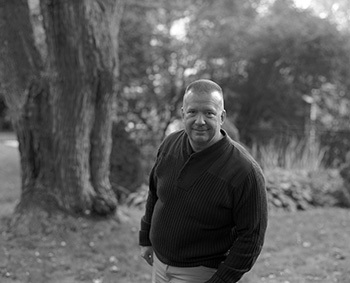 John Meadows has grown up up with photography as a teenager in the 1970s using a Kodak Brownie camera along with his father's Vito B. 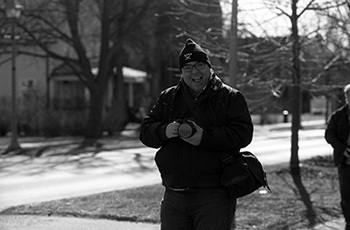 The arrival of his first SLR, a Yashica Electro-TL saw his photography expand. Learning the craft of film processing and printing in his Highschool Darkroom and using those skills to help out with his school newspaper and yearbook gave John the foundations he needed to continue on with photography. He would be drawn away from film briefly with a dabbling in digital photography, but the siren song of film would draw him back. A choice to return to film is one he doesn't regret on a single moment. Today John shoots a variety of subjects on a variety of cameras from his favourite TLR, a Rolleiflex 3.5E3 to a Hasselblad 500C/M, not to mention a Bessa Rangefinder and the mightly Nikon F4, their isn't a subject that John doesn't enjoy photographing. James loves making connections to the people he photographs and firmly believes in the friendships and connections made are paramount to emotional portraiture. 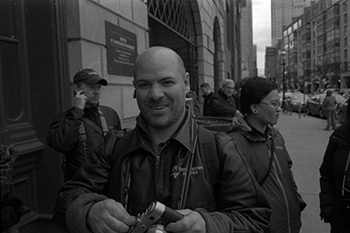 James has been involved in the craft since the age of 16 and learned the art of black & white using traditional film and darkroom techniques. He's done professional wedding work for several years. His recent reintroduction of film to his workflow is thanks to a chance meeting of Alex at a local Camera Club, and thanks to that friendship now have a massive selection of film cameras once again. James is a member of the Professional Photographers of Canada, Wedding and Portrait Photographers International, a former instructor at Sheridan College's Applied Photography Program, and brings a professional slant to the podcast. Bill Smith has been enamored with photography in his childhood playing with toy cameras before they were cool along with shooting in 127 format film when it was still around. By the time the late 1990s rolled around Bill was working in marketing and one birthday received a Canon Rebel G from mom and dad with a subtle hint he was working too hard. 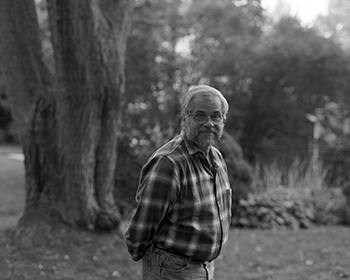 Later on Bill switched to older manual focus cameras, inheriting his dad's Leica M3 and early Nikon F and taught himself how to process black and white film and print in a darkroom. Over the years he collected both 35mm and 120 format cameras with a strong focus on manual focus gear from brands including Nikon, Canon, Olympus, Asahi Pentax, Minolta, Leica, Mamiya and Franke & Heidecke (Rolleiflex) and Hasselblad. 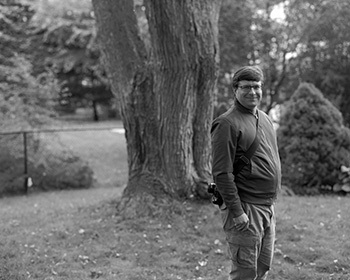 Bill shoots mostly black and white and C-41 and likes printing in his darkroom. Trevor is a recent addition to the co-host team, a long time professional photographer who got his start with newspapers. He even had a trusty F4 and F90x during the Blue Jay's second World Series victory (the one won at home). He is also an avid travel photographer and currently operates his own photography business running photo booths! It started with sneeking off with his father's Canon AE-1 in 1998, this little bit of rebellion would propel Mike into the world of photography. Oddly the AE-1 would not be Mike's first personal camera, that came in the form of a Canon EOS Rebel XS, a digital camera. 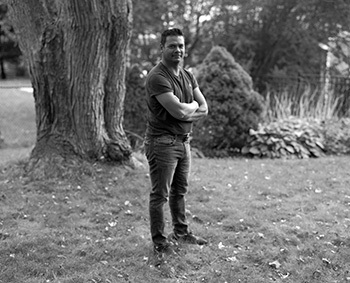 Despite his best efforts to get a creative edge and dating a girl who worked for Eastman Kodak Canada in Toronto, digital just didn't do it for him. He would try many different point-and-shoot cameras until his father's AE-1 was bequeathed to him. The memories of those early days of rebellion would help everything fall into place. Both his family and camera collection grew, photography became a part of the family dynamic. With his wife and two sons picking up the joys of film and art photography. Donna's journey into photography began well before her interest in it started, as she started working for the Toronto Kodak Plant. But after its closure, the idea stuck a little big. It was actually watching her husband, Mike, interest and needing a hobby she took a chance. She was hooked and has been shooting now four years running. While her first camera was a simple Kodak APS 400IX after getting into the hobby in a little more serious way an Olympus OM2n found its way into her bag. It was soon joined by a Bronica EC, Hasselblad 500C/M, and now even a Cambo 8x10! She even joins her husband in developing her own film!